Two stars of Channel 4’s Derry Girls have demanded the decriminalisation of abortion in Northern Ireland as they delivered a 60,000-strong petition to Secretary of State Karen Bradley. 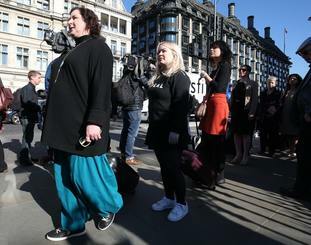 Nicola Coughlan, who plays Clare Devlin, and Siobhan McSweeney, who plays Sister Michael, joined 26 other women in the march at Westminster on Tuesday afternoon. The 28 women - symbolising the number who travel from Northern Ireland to other parts of the UK each week for an abortion - all carried the names of 62,000 petition signatories in suitcases. The campaign, organised by Amnesty UK, calls on the UK Government to intervene and change the law in Northern Ireland in the absence of ministers at Stormont. An abortion is only permitted in Northern Ireland if a woman’s life is at risk or if there is a risk of permanent and serious damage to her physical and mental health. The 1967 Abortion Act which governs the rest of the UK was not extended to Northern Ireland. Coughlan, originally from Cork, paid tribute to the Northern Irish support for the Repeal the Eighth movement to decriminalise abortion in the Republic, adding: "Women are being treated like criminals in their own country. "I’ve had friends who have had to make this journey, it feels very personal as well. "The people of Northern Ireland have been so good to us, we’re just lending our voice. We’re just trying to draw attention to this issue because nobody wants to deal with it." McSweeney dismissed suggestions the issue should be resolved in Stormont, adding: "It’s a human rights issue. The legislation in Northern Ireland is some of the toughest in the world, and Westminster have a duty of care." Also among the protesters were a number of MPs, including shadow Northern Ireland minister Karin Smyth, who called abortion restrictions "unacceptable". She said: "In England, women have had this right for 50 years, and somehow we think it’s acceptable that women don’t have the same human rights as us. That’s unacceptable. "Women are being squeezed between this argument about devolution and human rights." Calling Northern Ireland’s abortion rights "a stain on the UK’s democracy", Hannah Bardell, SNP MP for Livingston, added: "Women in Northern Ireland are having their human rights routinely ignored. "The fact we have women in the United Kingdom unable to access basic healthcare is an absolute scandal." Also at the Northern Ireland Office were anti-abortion Both Lives Matter, which claims an extra 100,000 people are alive as a result of Northern Ireland’s laws. Clare McCarthy, of Both Lives Matter, believes any decision on Northern Ireland’s abortion legislation must respect the Good Friday Agreement. She said: "Whatever decisions on abortion in Northern Ireland are made, it is vital in respect of democracy and of the Good Friday Agreement that they are made by Northern Ireland and by the Northern Irish people."